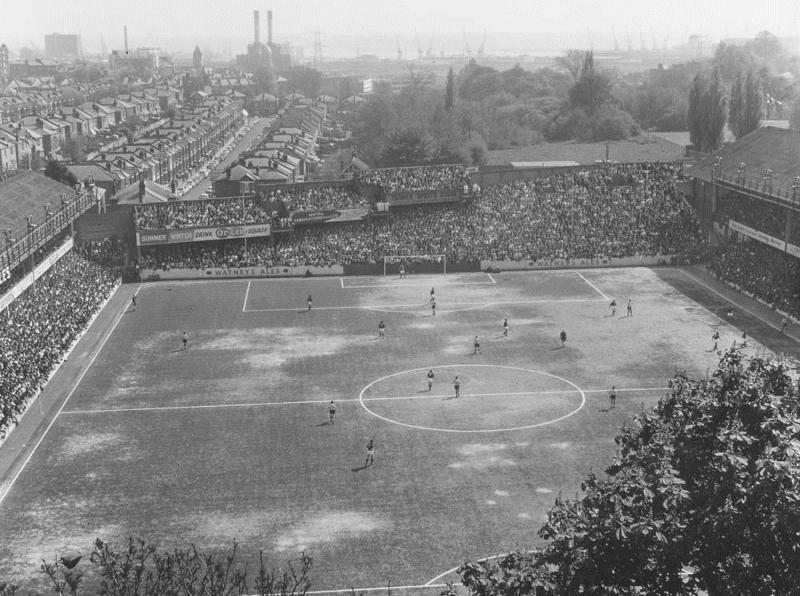 One of the quirkier and more memorable football grounds, The Dell was home to Southampton for over 100 years before they moved to St Mary’s Stadium in 2001. 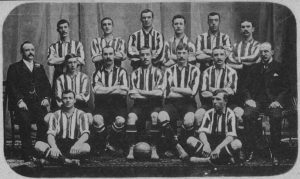 The St Mary’s name has been with the Saints since the very beginning of their existence as the club’s origins came from the St Mary’s Young Men’s Association. In November 1885 St Mary’s played their first-ever home match against Freemantle at a ground on Newlands Road. It resulted in a 5-1 win with Ned Bromley, later to be named captain, scoring a hat-trick. At this time the team were known as St Mary’s Young Men’s Association. This was abbreviated to St Mary’s FC in 1888 then to Southampton St Mary’s in 1894 and finally to the current name after winning the Southern League in 1896-97. 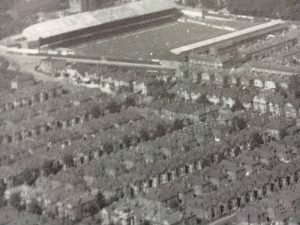 The club played at a number of grounds in their early years including Southampton Common (where matches were frequently stopped due to people wandering across the pitch), Newlands Road and then at the wonderfully-named Antelope Ground until it was sold for development in 1896. They then spent a short period at the local county cricket ground before deciding that the rent (£200 per year) was exorbitant and announcing the purchase of a plot of land for the construction of a new stadium. Saints were already proving successful. Three successive triumphs in the Southern League proved their credentials These were followed by an F.A. 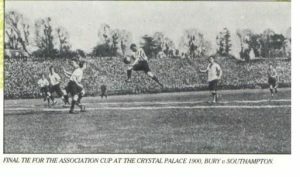 Cup final appearance in 1900 where they were comfortably beaten by Bury. Two years later they would again make it to the Crystal Palace for the final. This time, with the immortal C.B. Fry in their ranks, they took Northern giants Sheffield United, who included William (Fatty) Foulkes in goal, to a replay before losing 2-1. The Dell, described by one writer as ‘a lovely dell with a gurgling stream and lofty aspens’ was in a valley north of Southampton Central Station and the land was bought from the railway. Built at a cost of £10,000, The Dell was opened in 1898 with a match against Brighton United in which the home team ran out 4-1 victors with the opening goal coming from Scottish inside forward Watty Keay. Watty Keay. First Dell goalscorer. 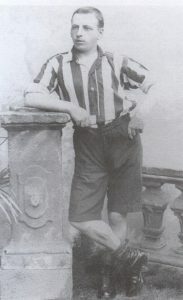 Keay had been lured away from Derby County, where he lined up regularly alongside Steve Bloomer, and would spend five years at the Saints before retiring in 1900 and being presented with a pocket watch for his sterling service. It was so highly thought of that it was chosen to stage an international between England and Ireland in 1901. 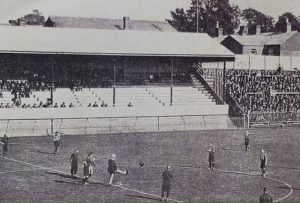 Funds to build the ground had to be borrowed so the club were effectively tenants until finally raising the money to purchase the freehold early in the 20th century. In 1904, Southern League Champions for the sixth time in the season just ended, ventured on a 17-day tour to Argentina and Uruguay, the first British professional team to do so. They played a total of six matches against local opposition, winning all and scoring a total of 40 goals. 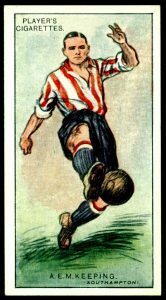 The team continued competing in the Southern League until, after the end of World War One, they were invited to join the Football League in the newly added Third Division which soon became the Third Division (South). By 1921-22 they were a Second Division side, having finished as champions. They would remain in the secon flight for 31 years. This period saw the debut of classy defender, and son of Olympic cyclist, Michael Keeping. An outstanding full-back, Keeping was signed from Milford On Sea FC in 1919 for the princely sum of £25. It took him a while to break into the firet team as Saints already had a fine player in his position in England international Fred Titmuss. But he eventually ousted his rival from the team in 1924 and from there on, he became a regular in the line-up, so much that Titmuss was allowed to leave for Plymouth Argyle in 1926. Known for his fastidiousness and dress sense (he would apparently spend hours getting ready before public appearances), Keeping featured for the Professionals team in the 1929 Charity Shield and also represented the Football League against the Irish League in 1931. However, the early 1930s saw financial problems at The Dell, brought about in part by construction work and Keeping was sold, along with Johnny Arnold, to Fulham for £5,000. He spent the rest of his playing career at Craven Cottage but perhaps his major claim to fame came in 1948 when he was appointed coach of Real Madrid, a post he would occupy for two years. The original Dell had two stands, East and West. A new West Stand was built in 1928 based on designs by the famed football architect Archibald Leitch. The following year the East Stand was destroyed in a fire and a new stand was built in the same style as the West. The Stadium was damaged twice during World War Two, once by a bomb which landed on the pitch and caused an 18-foot crater and the second time when there was an explosion and a fire in the West Stand where munitions were being stored. This forced them to switch home matches for a while to Fratton Park, home of local rivals Portsmouth. The Dell was the first Stadium in England to have permanent floodlighting installed, in 1950, with the first match played being a friendly against local rivals Bournemouth. Three times in the late 1940s and early 1950s the club came close to promotion to the top flight. Fuelled by the goalscoring exploits of the prolific Charlie Wayman, they came closest in 1949-50 when missing out to Sheffield United by 0.06 of a goal. Wayman had arrived from Newcastle United in 1947 and in three seasons at The Dell he scored 73 times in 100 appearances, teaming up with future manager Ted Bates. The sharpshooter had all of the attributes of a great centre-forward except for one. At 5ft6in he was definitely smaller than the average main striker and this lack was in all likelihood the only thing that stood between him and an international call-up. 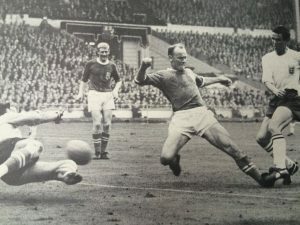 Wayman was eventually sold to Preston North End where he would continue his fine goalscoring exploits and the club plummeted down the table, finding themselves relegated to the Third Division (South) in 1953. Perhaps the most famous feature of the ground were the ‘chocolate boxes’ built at the Milton Road end of the stadium which gave a two tier effect and which remained until the 1980s. 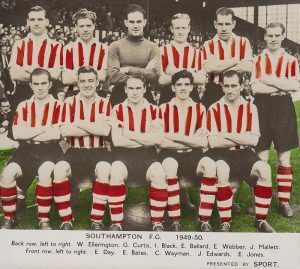 It took Saints seven years to regain their Second Division status then finally in 1959-60, 39 goals from Derek Reeves fired them to promotion. Three years later there was an F.A. Cup semi-final defeat to Manchester United and three years after that, fired by the goal of Martin Chivers they climbed into the top flight. By this time Bates had already been managing the club for 11 years. After he had secured First Division football for his club the manager signed Welsh striker Ron Davies whose prolific goalscoring kept them safely afloat in the top flight. Reeves, Chivers Davies and later Mick Channon were all fine goalscorers but they also owed much of their success to service received from wide men Derek Sydenham and more specifically Terry Paine. Paine arrived at the club in 1956 after playing for Winchester City as a youth, moving to Southampton after City manager, and former Saints player, Harry Osman recommended him to former teammate Bates. By the time he left, for Hereford United in 1974 he had spent 18 years at the club and had made a total of 825 appearances in all competitions as well as 19 England caps. The Dell hosted First Division football for the first time in its history in 1966 and in 1969 a record 31,044 crammed in to watch Manchester United – George Best, Bobby Charlton and all – beat the hosts 3-0. 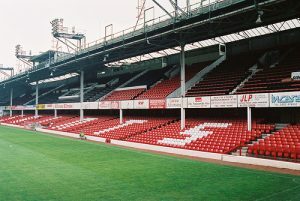 But the need to change to all-seating saw capacity greatly reduced and after searching for a new site for some time the club announced in 1999 that they would be moving to the newly-built St Mary’s Stadium. Before the switch there was one major moment of glory when, in 1976 they brought the F.A. Cup home to The Dell. 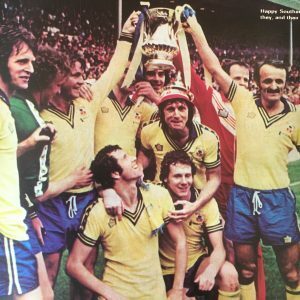 The team, now led by Lawrie McMenemy, saw off Aston Villa, Blackpool, West Bromwich Albion, Bradford City and Crystal Palace to earn their place at Wembley. There they took on Manchester United and a Bobby Stokes goal was enough to win them the trophy, still, to date, their only major honour. In 2001, 103 years after opening, Saints ended their time at The Dell with a real flourish, local hero Matt Le Tissier scoring the 89th-minute winner as they came from 2-0 down to beat Arsenal 3-2. A favourite of many away fans, The Dell, like many of it’s kind, became a victim of the need for more modern facilities. 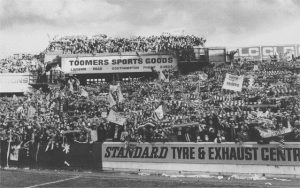 But it will always hold a place in the hearts of Saints fans, and many visitors too. And those living in the development now on the site of the former ground have reminders galore of the ground’s history with apartment blocks named after former heroes Bates, Channon, Le Tissier, F.A. Cup hero Bobby Stokes and Danny Wallace among others. The new St Mary’s Stadium is highly thought of and the club have done a great job in providing a ground that all attending can enjoy. But it can never be The Dell.